Italians love their salads and it is not unusual to have more than 5 or 6 different salads at a family meal. 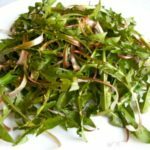 Often the salads are simple to prepare and have some very basic ingredients — olive oil, vinegar, garlic cloves, salt to name a few of the regulars. Cucumber sometimes with white onion, tomato with hot peppers and a specialty when in season is dandelion salads. 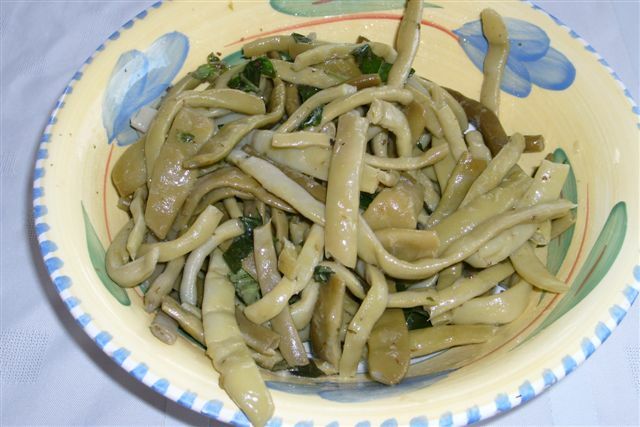 Today we are going to share a North American version of an Italian Colesaw Recipe which we hope you enjoy. Slowly stir the 1/2 cup of Italian salad dressing into the mayonnaise. 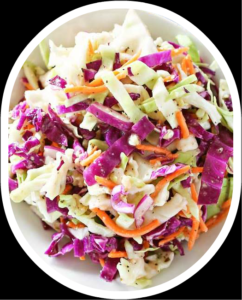 Once the dressing is blended or mixed well, you can add enough of the dressing mixture over the shredded cabbage to moisten; toss lightly. Add salt and pepper to taste and Mangiare! Thanksgiving is a time when Mamma adds so many side dishes to the table we do not even get a chance to sample them all. Cooking with beets and finding different ways to prepare them can be a challenge but Mamma makes these cooked beets fresh from the garden…wow, even carnivores eat them. Rinse with cold water and peel skin. Colder the water the better. Slice beets and place into serving bowl. Whisk the 1 tbsp of vinegar and 2 tbsp of olive oil together…drizzle over the beets. Mix well. Grate in one (1) clove of garlic. Add salt to taste and sprinkle of oregano….stir and serve. Buon appetito! Summer is all about BBQ and eating outdoor. 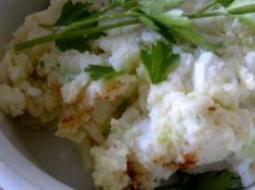 We hope you will give this potato salad recipe a try and let Mamma know whether it is a keeper by liking it below. Peel and boil potatoes. In a separate pot boil your eggs. Let cool. In a large bowl grate half of the potatoes and half of the eggs. Chop remainder of the potatoes and eggs into cubes. Finely chop the celery, onions, radishes and add to mixture. Add a serving spoon size of Mayonnaise and the 1/2 tsp mustard and thoroughly mix. If not moist enough add more Mayo. Sprinkle with black pepper and salt and mix until you reach your desired consistency. Finish with a dash of paprika and garnish with parsley. Place in fridge until ready to serve. So good! 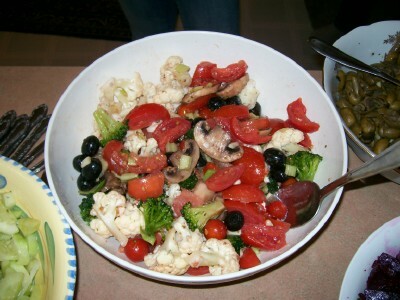 This is a seriously scrumptious salad … insalata di verdura. Without a doubt a real Italian classic. Boil beans until semi soft, drain water and let sit until they are cool to the touch. Pack cooked beans into jars. Add 1 Tbsp. of table salt into each jar. Pour boiling water and vinegar solution into jars. Seal jars and steam for 4 minutes. 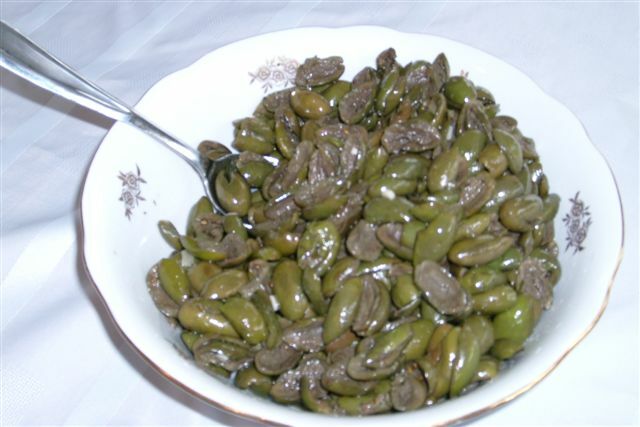 Remove green beans from jar, rinse with cold water and place into serving dish. Add 1/2 tsp oregano, 1 clove grated garlic and drizzle with oil. Mangiare! Crush firm green olives, removing the pit. Soak crushed olives in water for 4 days, remember to change water every day. Place olives into canning jars. Boil salt and water mixture, pour hot solution into the jars. Preparation: Pour contents of sealed jar into a bowl and soak the olives in fresh water for at least one day (over night is better, squeezing olives occasionally and refreshing the water). Squeeze as much excess water out of olives as you can and place into serving bowl, let air dry, add fresh garlic, oregano, salt, anise seed and olive oil to taste. Stir frequently and after they have been dressed allow them to sit for a few hours before serving. 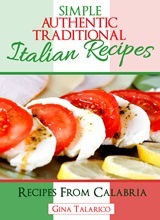 If you are a true olive lover this Italian recipe will become a keeper.